(2012). Evaluation of Biopolymers Effect on In vitro Biocompatibility Property of Nano Hydroxyl Apatite Composites. International Journal of Bio-Inorganic Hybrid Nanomaterials, 1(2), 97-103.
. "Evaluation of Biopolymers Effect on In vitro Biocompatibility Property of Nano Hydroxyl Apatite Composites". 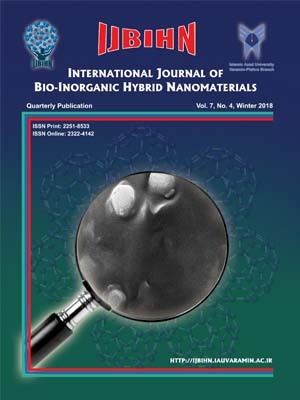 International Journal of Bio-Inorganic Hybrid Nanomaterials, 1, 2, 2012, 97-103. (2012). 'Evaluation of Biopolymers Effect on In vitro Biocompatibility Property of Nano Hydroxyl Apatite Composites', International Journal of Bio-Inorganic Hybrid Nanomaterials, 1(2), pp. 97-103. Evaluation of Biopolymers Effect on In vitro Biocompatibility Property of Nano Hydroxyl Apatite Composites. International Journal of Bio-Inorganic Hybrid Nanomaterials, 2012; 1(2): 97-103. In this work, we report the effect of biopolymers (starch and gelatin) on in vitro biocompatibility property of nano hydroxyapatite (nHAp) composites. Cell culture and MTT assays were performed for in vitro biocompatibility. They show that nHAp can affect the proliferation of cells and the nHAp-starch and nHAP-gelatin biocomposites have no negative effect on the cell morphology, viability and proliferation. By evaluation of MTT results it seems that starch composite is more biocompatible compare to gelatin one.